Good Morning! We drove up to Cumbria last night and disgorged the contents of the car into Dad’s house plus two poodles, who are good travellers but very bad at sleeping first night in unfamiliar places. Consequently one fell off the bed at 3.45 am with a loud thump. That is the same one who was in and out of vet most of last week, having eaten all the leather straps, tags and bobs on the manbag. 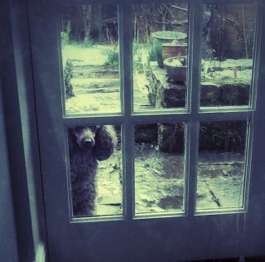 There was restless padding about, snuffling, grumbling, it went on and on, so in the interests of everyone I came down, stood by the backdoor while they hurtled out in the sleet, snorting and huffing, trampling snowdrops and so on. Then they came back in, presumably having scared up any resident shrew or hedgehog picking up the remains of the bird seed. They then expected to be rewarded for this appalling behaviour with food. I thought not. Sleep has eluded me and I am so not amused. So here I am several hours later, pretending to take revenge by leaving the dog outside for all of five minutes. She is back indoors now, carrying her squeaky toy around and asking for a game. Dad has been profiled in local glossy magazine, Cumbria Life, quite surreal to imagine people staring at this while they sit in the dentist’s waiting room. Roll on Sunday morning – what are you all up to today? This entry was posted in Family, Pandering to Poodles and tagged Cumbria Life, Michael Baron, poodles, revenge on 17/03/2013 by Joanna. Back from Harrogate. Spent a couple of nights there as Sue was attending her graduation ceremony having completed her MA in Art History. First time in Harrogate, nice place to explore! Today I am planning a short run, make a loaf and chill out before being back at work tomorrow. I have heard that Harrogate is lovely! Congratulations to Sue !! Have a peaceful relaxing Sunday Ray. Now those cheeky poodles…a man bag eh? What was so tasty about that? Sunday evening here. Windy and it looks like Autumn might have finally raised her head just a little. Brydie, He is always up to something…btw the manbag was a very nice one from The Healthy Back range, nothing but quality leather trim fir the discerningly stupid poodle. Seasonally we would just like it a leetle warmer and drier! It’s amazing how much noise a small animal can make falling off a bed! Hopefully you can sneak an afternoon nap. Poor Zeb!!! But it is so much like a child sleeping in unfamiliar surroundings, it’s really quite funny – at least, it is if your not the one being kept awake. You must be very proud of your Dad. As Brydie says, it is Sunday night here and extremely windy, hopefully it will blow the summer a little further away – it’s outstayed it’s welcome and I would like to shut the door on it for several months. We would like summer this year, just a few weeks would be fine – though I know it has been very hot and dry for you and not much fun. Zeb is a monster of neediness. Looks cold outside. Here, too! Wish Spring would quit dallying about. I like that picture of your father in his study- he looks very much a poet and thoughtful man there. And better to look at those pictures in a dentist’s waiting room than to squirm about thinking of the procedures that are awaiting them. Traveling with dogs sounds every bit as difficult as traveling with children. I’m really a stay at home person- I travel, but not happily. I like arrivals so very much. Sunday here- getting ready for my second breakfast- and getting ready to travel to the East coast tomorrow. The dogs sleep like angels in the car, it is just unfamiliar surroundings gives them a huge adrenalin spike or something and they take two or three days to adapt. Are you off to the sea? Bon voyage Heidi ! Just to the beach- not out to sea! Actually just a short check on the house there and then perhaps a quick scuttle out to the beach and then home again, home again, jiggety jig! Life hereabouts has been quite nice – I think we are experiencing the vagaries of global warming – frankly, I like it! This winter we’ve had very few days of frost, and the rain is really down this month – all the trees are weeks ahead of their normal budding schedule – we’ll have to wait and see what the absence of cold may do the fruit production. Can’t all be good, I suppose. Have fun on your visit, and I hope you get some good meals too. Hi Jo, I am in the midst of our grey and damp days called end of winter – hopefully! That is one bread I have never made, though I admire the photos that I see of it :) Waiting for Spring, lambs everywhere in the fields here! Hi Jo, I hope you have a lovely time with your Dad. I’m on holday in New Zealand at the moment. I’m looking forward to travelling to Dunedin to visit old friends tomorrow. Perhaps the little people will let you have a sleep tonight! Oh, that little face at the door……..! Sorry to hear of the destruction of the manbag and consequent visits to the vet. Spot has never chewed up anything of that kind but I have to watch him like a hawk when we are out in case he picks up something unsuitable. He ate cocos palm seeds not long after I got him and the result of that was very expensive surgery. I had to smile at a dog falling off the bed – I’m the one in danger of falling out here as Spot has a way of creeping further and further over and I wake up in the morning with his lordship ensconced in the middle of the bed and me clinging to the edge! 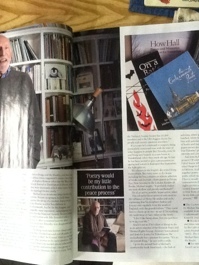 How lovely to have your Dad in the magazine – have a great time up North. Ann, it got worse this week and we had to visit a different vet (that makes three vet visits for this particular incident) but yesterday, 12 days after the original sin, he ‘passed’ something akin to a giant cuban cigar, 6 inches by 2 and a half of solid leather all rolled up. He had been in agony the night before and we had gone to the out of hours vet up here. He is not back to normal yet, but getting there I hope. He slept in the middle last night. We gave up. I do hope you’ll forgive me, my darling, but I burst into giggles every time I read this post. I suspect that only people who love live-wire dogs would understand why I’m giggling. You have done my mood miracles with this post. Thank you, and best wishes to you and all. I am hoping to update it in a few hours. I lost all access to the kitchen and most of the house all day, so I’ve not had a chance to play with photos.